Neptunes Kingdom Classic Slot Guide & Review - Casino Answers! Neptune’s Kingdom is a 3-reel, 5-line classic slot machine developed by Playtech. You can play the Neptune’s Kingdom classic slot machine at Bovada. Bets on the Neptune’s Kingdom slot machine are $0.05, $0.10, $0.25, $0.50, $1, $2 and $5 per line. You can play 1-5 lines on Neptune’s Kingdom by using the “Bet One” button. Neptune’s Kingdom is a nickel slot machine, so you can bet anywhere from 5 cents up to the maximum total bet of $25 per spin. Neptune’s Kingdom has a decent betting range that most slots players should enjoy regardless of the size of their wallet. You can play the Neptune’s Kingdom slot game by selecting your bet and hitting the “Spin” button. To play all 5 lines, press “Bet Max” to spin the reels. The highest paying symbol on Neptune’s Kingdom is the Treasure Chest symbol. If you line up 3 Treasure Chest symbols on the fifth payline, you will win the 150 coin top jackpot. On other paylines, the payout for 3 Treasure Chests will be less. You can win the jackpot on Neptune’s Kingdom when you play at Bovada. There are 6 winning combinations on the Neptune’s Kingdom classic slot machine. The complete payout schedule is as follows (line 1/2/3/4/5 payouts listed in parenthesis when applicable): 3 Orange Fish symbols (20), 3 Lobster symbols (25), 3 Green Fish symbols (30), 3 Trident symbols (40), 3 Mermaid symbols (50) and 3 Treasure Chest symbols (100/110/120/130/150). The autoplay mode on the Neptune’s Kingdom slot machine is located under “Menu.” You have the option of simply entering the number of spins or you can use the arrows on the left side to expand the autoplay feature into the Advanced Mode. You can set the stop settings of: Jackpot win, single win more than (up to $99,999), overall Win more than (up to $999,999) and overall loss more than (up to $999,999). You can also set the delay between spins to speed up the autoplay. Autoplay can be cancelled at any time by using the “X” button. Neptune’s Kingdom is a below average slot machine, due to the low payouts on the slot. Neptune’s Kingdom is only recommended for those who want a mermaid-themed classic slot or those who like smaller, more frequent wins. You can play it for real money when you sign up and deposit at Bovada. 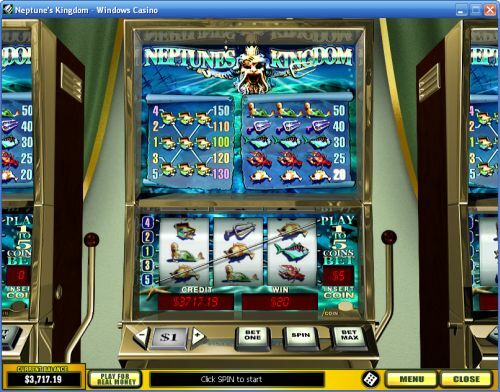 Can USA players play the Neptune’s Kingdom online slot for real money? American players cannot play Neptune’s Kingdom for real money. USA players can play a similarly themed video slot called Triton’s Treasure at Bovada. Can I play a Flash game of the Neptune’s Kingdom slot machine for free? Yes, you can play the Neptune’s Kingdom free Flash game at Bovada. You can play for real money or you can play for free. If you have any issues with the Flash casino, you can download the most recent version of Adobe Flash Player.